here's a simple RPNcalculator, made with WinFBE. it's not quite perfect, there's no keyboard input and that's beyond my ability to implement. the stack size is 1000 but only the first 4 are displayed. 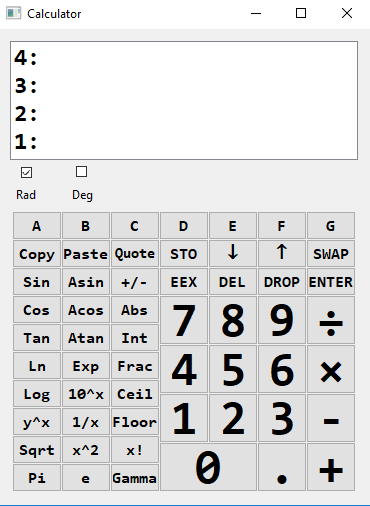 updated the calculator to handle keyboard number and arithmetic operator entry, also the enter or return key act as the return button. Last edited by srvaldez on Jul 30, 2018 14:38, edited 2 times in total. the bas file is garbled? Seems to have a utf8 bom attatched. You'll need an ide like poseidon to open the .bas file. It is not in my afx folder. Must be in the WinFBE editor?? The .exe runs OK of course, after a discussion with Win 10 anti-virus. thank for testing, yes you need to compile with WinFBE or perhaps copy the contents of the WinFBE_Suite\FreeBASIC-1.06.0-win32\inc folder to your FB distribution, have not tested this, so I suggest you make a backup of your inc folder, just in case. this project was an exercise to get familiar with the WinFBE Visual designer and perhaps inspire others to give it try. Those includes are regular ANSI files. In a WinFBE project you can have ANSI, UTF-8, or UTF-16 encoded files *however* any visual designer created source code file in WinFBE will always be UTF-16.